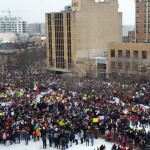 On February 18th, thousands of people showed up at Madison’s capitol to protest the proposed anti-immigrant laws AB450/SB369 and SB533/AB723. AB450/SB369 would encourage the police to ask people who have been charged with a crime about their immigration status. SB533/AB723 would prohibit local municipalities from providing local ID cards for undocumented people and those who lack the documents to obtain state Ids. JONAH was able to get in contact with a local Latino business owner, Javier Sandoval, and two JONAH members, Joyce Anderson and her daughter Emily Anderson, who attended the march to get their thoughts on the march and the laws they were protesting. 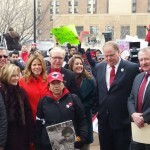 As a Latino, how did it feel to see the Latino community come together to protest these laws? Javier: It felt very good that we got together and we are fighting together for something that we believe is right. And the other thing, I’m happy about it because everything went well. No one did something wrong in the capitol, so, I think it was good. I feel proud about my people, they didn’t do anything wrong. How did it feel to see people outside of the Latino community show their support? Javier: I guess, some people can see what we do here because we didn’t come here to cause any trouble. We came here to work and I think we help the community and we help the United States in a lot of things that people sometimes don’t see. Like farmers, a lot of people don’t like to work that, so, we do it. And I think us working for farmers, we help, because they pay—sometimes less money—and that way you can get your milk cheaper. How did it feel to see so many people come together to protest these laws? Emily: It was a moving experience to see so many people stand up for themselves and make their voices heard. The photos from the event are incredible, and it was beautiful to see the city come alive with people–mostly families–together in solidarity. It was great to see so many students bring energy and their creativity to their signs and chants, and I loved seeing parents taking children in strollers, teaching them how to participate in democracy. I feel like I got a glimpse of the future of Wisconsin. Forward! Joyce: I’m reluctant to call this a protest. It was more like the people, as Emily described, gathered together to try to explain that they are contributors to our workforce and our communities. In that respect it was more like a plea of recognition of their contribution. Describe the atmosphere of the march. Did it feel hopeful, angry, or passionate? Javier: I think it was more like passion, like, the feeling it was that you are doing something…hoping that you’re going to get something that is going to help and I think it did. Emily: To me, the event felt hopeful and empowering. I hadn’t realized how many Latinos live in Wisconsin until I came to this event, where 20,000 protesters, many of them Latino, were singing and chanting in Spanish. I loved hearing Spanish echo against the marble walls of the rotunda, a space that seems designed to amplify the voices of the people. One of the chants was, “el pueblo, unido jama`s sera` vencido,” [sorry don’t know how to do accent marks in email] which means “the people united will never be defeated.” I was overwhelmed by the courage of the protesters, some of whom were risking their jobs, who traveled sometimes hundreds of miles to be there. People with such passion and commitment, coming together to seek justice, will eventually triumph. So again, I felt like I saw the future. Joyce: For me, the atmosphere was very hopeful but it was also prayerful especially when we heard and saw people marching around the capitol with rosaries praying. There was also drumming and dancing and for me it was a recognition of another culture whose gifts were being brought to enrich our state. How did you feel while you were there? Javier: Happy, proud, and it was a good feeling. Emily: One of my favorite moments was when we were outside and a news helicopter flew over to survey the crowd. We all looked up and started waving and cheering. I felt really privileged to be a part of such a beautiful crowd. Joyce: For those of you who know me, you will not be surprised that I became very emotional as I saw the families – grandparents, grandchildren in buggies – all streaming from different directions onto the capitol lawn, in many ways proclaiming, “We are Wisconsinites.” I also felt very emotional in the rotunda when all of the voices were chanting “Si Se Puede” (yes, we can). There was an awe about not only are we workers in this state, we too can lift our voices. What types of things were happening at the protest? Javier: Well what I like about it was there were Anglos, they were supporting us and people from another country. It was a good feeling. I was hoping to see people from another country and seeing that it was very good. Emily: One thing that was cool was that local businesses closed their doors in solidarity and in acknowledgment of the importance of Latino workers to their businesses. There was also singing, dancing, and chanting. I loved being inside the marble rotunda in the capitol– the way the voices of the crowd resonated made me feel that the building had been designed just for this purpose. Why is it important to you? What were you standing up for? Javier: Because I have a Latino or Hispanic business and if that law goes through, who am I going to sell my products to? And also, because I like to support my people. I know they didn’t come here to cause trouble and I know they came to work because that’s what I did in the beginning. I didn’t have a business when I came here. I started working in a Christmas tree farm. And I know this could be like Arizona if we don’t do something about it. So, that’s why I did it. Emily: I went to Madison because I live in Wisconsin and I don’t want to live in a place where compassion and hospitality toward newcomers is viewed as optional. Also, we have to recognize that our state’s major source of pride (the dairy industry) relies on Latino immigrants. We owe them, just like we owe all workers, the opportunity to and live and work with dignity and without fear. So, on the one hand, I came to show solidarity with the Latino community. On the other hand, my reason for coming was because I see the state’s response to immigration as part of a larger trend that affects me and my ability to participate in democracy. I see these laws as part of a power move by the state government, who seem motivated to a) reduce local control and consolidate power at the state level (for instance by banning sanctuary cities and blocking cities from creating local identification cards to help residents) b) flex their muscles by granting police extra powers (such as the power to request immigration status of anyone they stop). Both of those things impact me, the first by reducing the power of my elected local officials and the second by creating a climate of fear around police that I don’t want in my community. I don’t want to live in Arizona. I want to live in Wisconsin. Joyce: It’s very clear our faith tradition calls us to welcome the immigrant. Having had the privilege of meeting immigrants I wanted to stand with them to let them know that there are many, many citizens who honor and respect their work. We need one another. How do you think the protest affected the pending legislation and any future legislation related to the immigrant population? Javier: Well I hope that, in a good way, it helps to let them see that we contribute to this country. That we don’t come here to do bad things, or, I don’t know, like what Trump says…I don’t think that’s true. I know that in any race there’s bad people and good people. But I think eighty or ninety percent of our people who came from Mexico, they came because they don’t have the life that they would like to have, and that’s why we came here. And I hope that they will see that and it will help in a good way. Joyce: Because state governance can dismiss 100,000 people protesting Act 10, I went to Madison without the anticipation of anything changing. The protest strengthened my conviction of the importance of fair and just laws for our immigrant neighbors. Do you feel that the protest helped in other ways, besides trying to change legislation? How? Javier: Not sure about it. But, I’m hoping that everyone will appreciate what we do and that even the people that give us work appreciate that we are doing something good even in the field, in the farms, doing the work that, to be honest, most people don’t want to do. So when they start to learn and appreciate what we do and how we contribute to this country, I think that’s going to help a lot. Emily: It can be easy to be cynical and to stop trying. But change never happened that way. Events like these can re-energize people and remind them of who they are and what’s important to them. Joyce: Yes, it was affirming for all of us present to see the numbers of people who are making Wisconsin work. Are there any last thoughts about the protest that you’d like to share? Javier: I’m just hoping that they can give us a driver’s license because that’s going to help everybody. Because sometimes you drive in the street and you don’t know who’s next to you. And sometimes when you give the right tools to the people, they will do better. But now there’s people driving and they don’t know the traffic streets or rules, and that’s not safe for anyone. Joyce: Everyone needs to vote and use our democratic process to ensure our values our reflected in legislation.